For those who like to live in the fast lane we offer our Racing Series. This model is a larger version of our best-selling Formula Series (F-Series) chair. With a taller, wider, backrest, the Racing Series complements a bigger-built user. The Racing Series' high-density cold cure foam filling makes these chairs comfortable for extended use, especially for durations of 8 hours and longer. With a tubular steel frame and a metal star base, as well as comfortable armrests, the Racer Series offers superb stability. 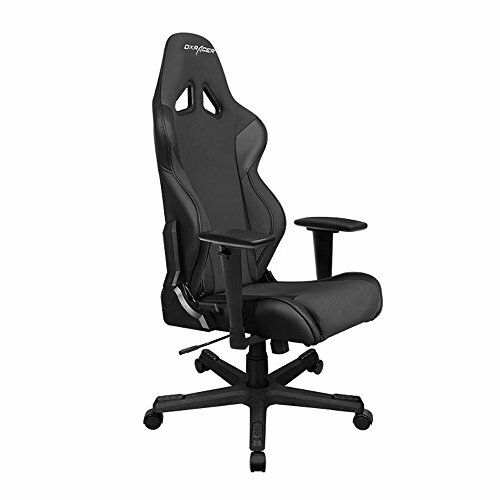 With an integrated headrest, adjustable lumbar support cushion, In addition, the DXRacer seat can be lowered degrees, to a comfortable position for power napping during long overtime sessions at night, due to its angle adjuster. you're sure to be comfortable. Now with a brand new footrest-shaped base made out of extremely strong nylon material that is stronger than steel, the Racing Series is built to last longer than ever before! Maximum Seat Height : 20.5"
Minimum Seat Height : 17"
Maximum Arm Height : 29.5"
Minimum Arm Height : 23"